Join over 4 million people who love and play QuizUp! 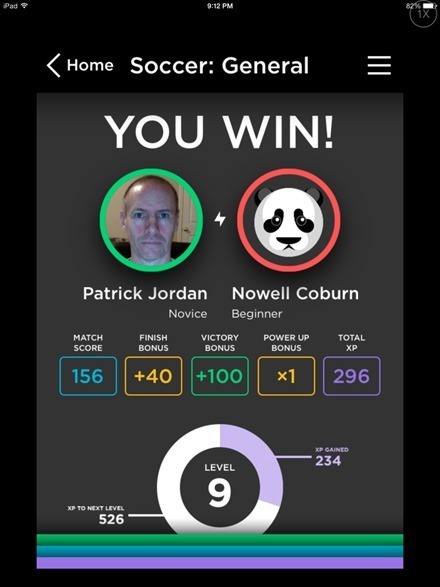 Challenge your friends and connect with others around the globe in the largest real-time trivia game ever. 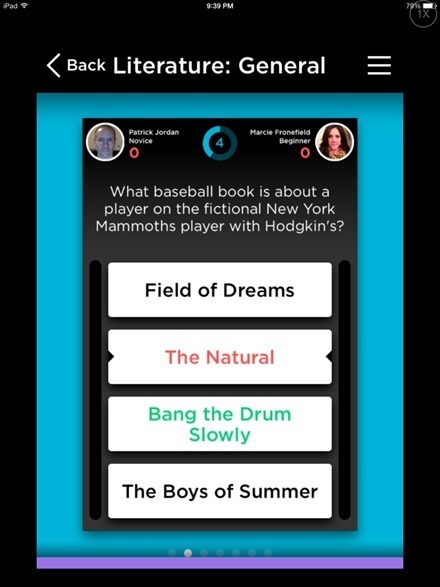 Go head to head in over 150,000 questions and 280 topics ranging from your favorite TV shows and books to sports and music. With new topics being added all the time, QuizUp is sure to keep you entertained and test your knowledge for hours on end! 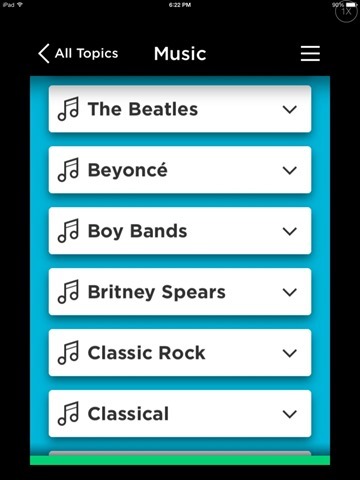 The range of categories, and deep levels of sub-categories, is one of the most impressive things about QuizUp. Categories include Sports, Books, Tech, General Knowledge, Science, Music, Movies, Games, Business, Logos, History, Geography, and lots more – with new topics being added all the time. The game is easy to play. You just pick a topic and dive right in. All the games are head-to-head matchups and you can invite friends to play or match up against randomly selected opponents. The random opponent games load up very quickly, much faster than I’m used to seeing in many other similar games. Each love game has 7 questions on the chosen topic and the faster you answer correctly the more points you get. The final round question is worth double points for a correct answer. 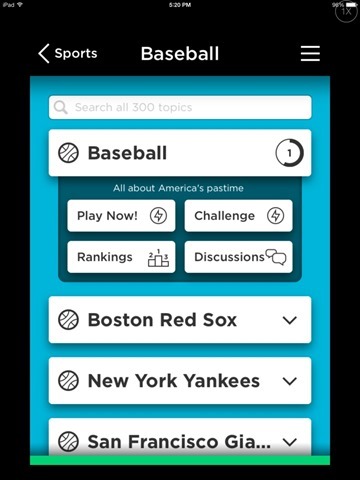 I’ve tried my hand at a good range of topics – Sports in general, baseball, basketball, soccer, tech, literature, music, logos, and more. I’ve found the question sets on all of them to be quite challenging, especially given the need for answering quickly. I like the fact that you have a separate level status for each individual topic. So, for instance, I’m currently on Level 12 in Tech and Level 11 in Soccer:General, but only a Level 2 in Sports: General – because I haven’t spent much time with that last one yet. I also like how easy it is to ask for an immediate rematch with an opponent after a close or interesting game. And you can issue your own rematch request or accept or reject rematch requests with just a quick tap. 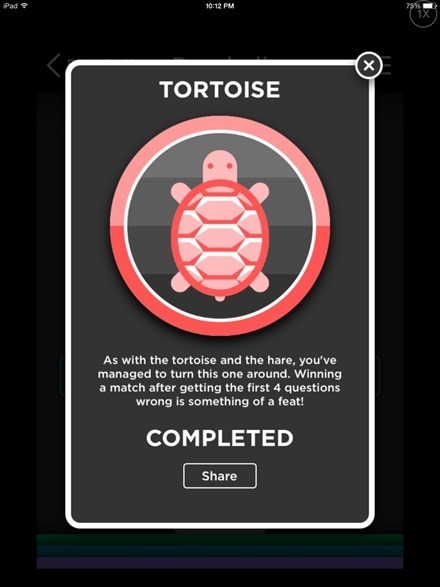 The game notes your progress as you move up the ranks or reach particular achievements. 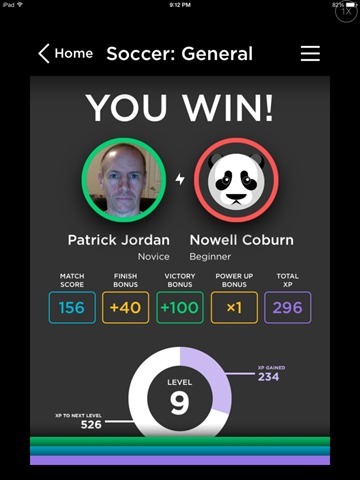 I’m a big fan of trivia games, and QuizUp is an instant big favorite for me. It’s not mildly addictive. It’s full-on crazily addictive. Just one more game and I’ll eat dinner that turns into 12 more games and 5 rematches type addictive. 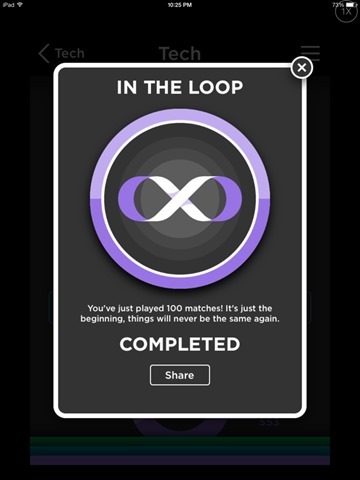 I only just started with the game in the early evening yesterday and hit 100 matches within a few hours. The game is free but also has In-App purchases ranging from $1.99 to $5.99 to up your experience points. So far, I feel no need at all to use these and think it’s absolutely viable to just play the game and move up. Here’s an App Store link for QuizUp; it’s a free app with In-App purchase options as mentioned above.